That simple question is the essence of the Fermi Paradox, posed (if only, perhaps, apocryphally) by nuclear physicist Enrico Fermi. More expansively: if life arises naturally on suitable planets, then why -- with so MANY stars around us -- hasn't intelligent life contacted or visited Earth? If aliens haven't, maybe the premise about life arising naturally and then intelligent life following naturally is suspect. Traditional SETI, based on listening for radio signals, has been noticeable for its lack of success. It turns out listening isn't the only SETI option. 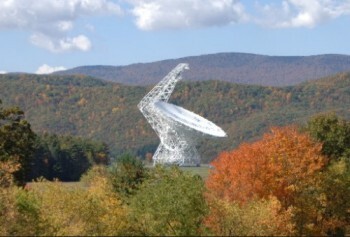 There's a SETI offshoot called search for extraterrestrial artifacts (SETA). A subset of SETA is search for extraterrestrial vehicles (SETV). The dressed-up term for it is xenoarcheology. Like astrobiology, xenoarcheology is a science for which, to date, there is no proof of the existence of its subject matter. Finding (or thinking one has found) physical evidence of aliens is an SF staple. Consider, for example, the black monoliths in the acclaimed 2001: A Space Odyssey. And I've always been partial to the cover at left, from James P. Hogan's Inherit the Stars. The SETV argument goes like this. Signaling across interstellar distances takes a lot of energy. Sending that (expensive) signal yields a benefit only if someone hears it. Sending a space probe is much more energy efficient -- albeit slower -- than beaming across the light-years. The visiting probe can gather data independent of the tech level of any creatures in the visited solar system. The probe can also choose to announce itself with a locally transmitted signal. Proponents of SETV advise us to look around our solar system for alien spacecraft. that the aliens have a very patient civilization that's expected to be much longer-lived (and static?) than anything we humans have accomplished. in conditions safe for the probe. So: not on Earth itself. A probe on Earth can't see much of Earth, and is subject to (among other dangers) earthquakes and weather. Not in low Earth orbit, because such orbits can decay. Not in the Van Allen belts -- too much wear-and-tear on the probe. (I don't find that argument compelling: if the probe survived cosmic rays -- unsheltered by any star's heliopause, for the duration of its journey -- I'd expect said probe to be fairly radiation-hardened. Personally, I'd add the Earth-facing side of the moon. Once the period of late bombardment had passed -- call it about 3.9 billion years ago -- the moon's surface became fairly safe. There's not a lot of weather or seismic activity on the moon. There's plenty of sunlight for energy (any probe that can cross light-years can surely store power for two-week lunar nights) and material for many kinds of self-repairs. Viewing is uninterrupted and is from a comparatively close distance -- certainly closer than the sun/Earth L4/L5 points. NASA's Lunar Reconnaissance Orbiter has captured images of Apollo landing sites. Maybe someday soon the LRO will spot something even more interesting. It will take a concerted search, though. The moon, even "just" the Earth-facing side, is a big place. And nothing says the hypothetical probe will be anywhere near as large as an Apollo landing stage.